Ven Dr Pallekande Rathanasara Thera has been appointed Anunayake thera of the Amarapura Wajirawansa Nikaya and Chief Sanghanayake Thera in Russia by the Karaka Maha Sangha Sabha of the Nikaya. He will receive his act of appointment from Economic Development Minister Basil Rajapaksa at a ceremony at the BMICH, Colombo on July 12 at 3 pm. Parliamentarian Karu Jayasuriya will present the Vijinipatha. Most Ven Dawuldena Gnanissara Uttareetara Mahanayake Thera of the Amarapura Maha Nikaya will preside. The Maha Sangha led by Ven Dodampahala Chandrasiri Mahanayake Thera of the Sri Lanka Amarapura Maha Sangha Sabha, Environment and Renewable Energy Minister Susil Premajayantha, Presidential Advisor Saman Weerasinghe and the Russian Ambassador will also be present. Born on January 7, 1953 at Udahena, Walasmulla to parents Welhenage Gunadasa and M D Gimarahamy and named Welehenage Ratnasuriya, he received his education at the Kanumuldeniya MV, Walasmulla. 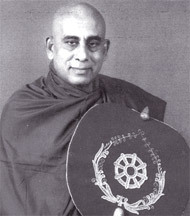 He was ordained on May 10, 1968 under the tutelage and preceptorship of Ven Pattupitiye Gunaratana Nayake Thera and Ven Pattupitiye Vajiragnana Nayake Thera and named as Pallekande Rathanasara Thera. He received his higher ordination on July 20, 1972 at the Vijayasiripura, Sri Pushparama Seemamalakaya. After entering the Kelaniya University in 1974, he left for Russia on a scholarship the same year to study at the Lumumba University. He completed his degree the doctorate from the Lumumba University and studied the Russian Language while in Russia. He also received the Russian honorary title Pushkin for his excellence in teaching and popularizing the Russian language and held important positions in youth organizations while at the Lumumba University. He has also been bestowed with the honorary citizenship in Russia. May the blessings of the noble Triple Gem be with Ven Dr Pallekande Rathanasara Thera for good health and long life to continue his sasana service for many more years. Ven Galagama Dhammaransi Thera, Co-ordinating Officer to the President.